Meadowbank School for Girls is not just a school; it is a work of art. Miss Bulstrode contemplates her life long project and feels that it is now time to retire - when things are at their peak. But things are fast approaching a collision course when an international conspiracy, a killer, and a bag of jewels all converge; two weeks later, Miss Bulstrode sees her life's work lie in ruins about her with two murders occuring side by side. Things may have remained unresolved if Julia Upjohn, a student at the school, hadn't had the presence of mind to figure out the mystery, and call in the great Hercule Poirot. 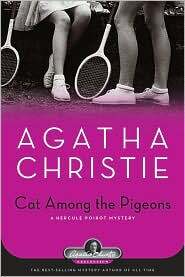 One of my favorite Agatha Christie novels, Cat Among the Pigeons has a lot of great characters. I love the unique teachers: Miss Rich who has genius and goes about with her hair falling about in disarray, and Miss Bulstrode, 'The Presence' whom all revere and fear; and the others: Mrs. Upjohn, a fond mother who is somewhat absent-minded, and has a weird sense of adventure (a friend of Mrs. Summerhayes who appears in Mrs. McGinty's Dead); and finally her daughter Julia Upjohn, who looks after her mother and is the only one smart enough to discover the mystery. The ending may not have been as interesting as the rest of the novel, but it seemed natural. The expert deduction of Hercule Poirot wasn't as 'great' at it normally is and if I had been reading the novel for the first time, I would have been surprised by the identity of the killer. I'm looking forward to reading this one in 2012. Thanks for the great review. It really sounds good.